It was meant to be a two-week holiday to celebrate her sister's birthday, but for Schapelle Corby it ended up a waking nightmare. Arrested at Denpasar airport after marijuana was found in her luggage, she became the victim of every traveller's darkest fear. Over four kilograms of drugs had been planted in her bag after she'd checked it in and she was forced to face the consequences of someone else's crime in a country where the penalties for drug smuggling are among the harshest in the world. Her trial and conviction became one of the biggest news stories of the decade and her family watched in horror as she was sentenced to 20 years in jail. Yet despite the huge media coverage, the one voice the public never properly heard was Schapelle's. Now, in this compelling book, she tells her own story: of being wrenched from a carefree holiday and incarcerated in a stinking police cell and of learning to survive - in the squalor, discomfort and violence of an Indonesian jail. It is an account like no other and will be one of the most unforgettable books you'll ever read. Schapelle Corby was born in 1977 in Queensland, Australia. She was imprisoned in May 2005 and is serving her sentence in Bali's Kerobokan Prison. Her current release date is in 2024. Kathryn Bonella first got involved in Schapelle Corby's story in 2004, while working as a producer for Australia's 60 Minutes show. 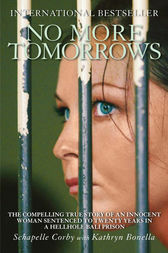 In 2005, Kathryn moved to Bali to work with Schapelle on this book.